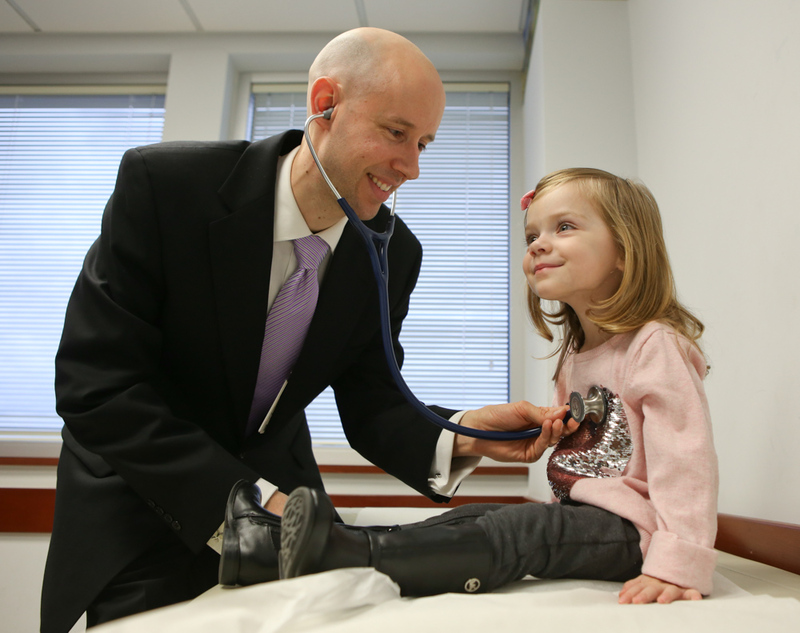 Pediatric cardiologist Dr. Peter Vande Kappelle exams Gabriella Davies. Erin and Rob Davies of Boardman are not doctors, nor trained ultrasound techs, but even they knew something was wrong when the room suddenly went quiet during their baby’s 20-week ultrasound. The mid-pregnancy anatomy scan is the prenatal visit many parents look most forward to, where they can see their baby forming in the womb and often identify their gender for the first time. But for the Davies, it turned into a life-altering experience. The ultrasound tech called in the obstetrician, who detected a possible heart defect. He immediately contacted Dr. R. Peter Vande Kappelle, Jr., Akron Children’s pediatric cardiologist, and got the Davies in to see him that same day. “He said, ‘Whatever Dr. Vande Kappelle tells you, go with,” Rob said. 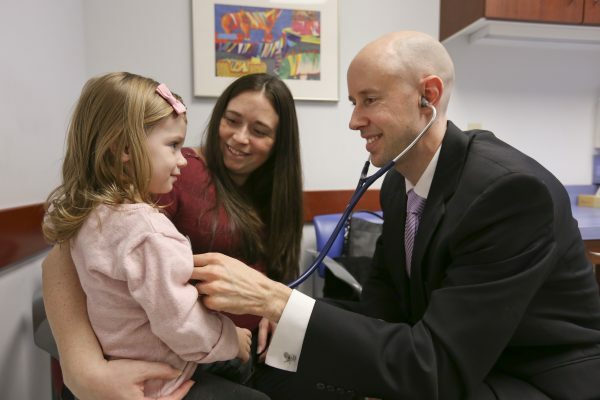 Dr. Vande Kappelle diagnosed the Davies’ baby girl with a heart defect called atrioventricular septal defect (AVSD); a relatively common one among heart defect types, and one that would require surgery to repair in the months following delivery. Gabriella sits on her mom Erin Davies’ lap as Dr. Vande Kappelle examines her. Dr. Vande Kappelle said 1 in 100 babies are born with some form of heart defect. Not all require surgery, but in the Davies’ case, it did. Although they were alarmed and fearful, doctors were confident Erin would ultimately deliver her baby. Further, they told them there would be a point in the baby’s early development when she would show exhaustion and have difficulty gaining weight. That, they said, was the point when surgery would be performed. Baby Gabriella was born 1 month early and weighed 5 pounds, 11 ounces. Two months and a day later, she reached the point of needing surgery, which was successful; and now 2 1/2 years old, Gabriella is a “typical toddler,” her mother says. “She can do anything that any other child can do; play sports, jump around, whatever,” Erin said. Dr. Vande Kappelle said the Davies’ story is one of emphasizing the importance of prenatal screenings. The Davies, now expecting another child, have been equally diligent in their prenatal care with this pregnancy, and were cleared of any heart defects with this child, a little boy. Is It Time to Switch to an Adult Doctor?